From th early 1880s through the turn of the century, the standard issue frontier cavalry hat, was a tan felt campaign hat. Unlike the movie military, the US Army's official issue hats were generally of this type, not the broad-brimmed white hats so often seen on the silver screen. One of the most often-worn styles of headgear in the Old West was the flat-brimmed, straight sided crown hat with rounded corners. This popular hat was know as the " Boss of the Plains" style and was sold by just about every hatter throughout the U.S. The style was made by several firms, and was popular from well before the Civil War until long after the turn of the century. 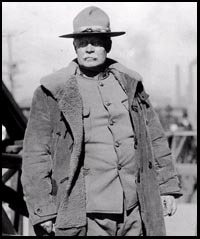 The hat in the photo above, is also similar to the style of hat that was adopted by the U.S. Forest Service, a "Boss of the Plains" with an added "Montana" or "Smokey the Bear" creased crown. During the later years of the 19th century, West Point focused on a more narrow military curriculum, and its graduates formed the heart of the army’s officer corps. Many graduates spent their military careers in the frontier cavalry, engaged in the last Apache campaign in 1885-1886, and later the Spanish-American War from 1898 to 1906.